The Seminoles’ bowl streak began in December 1982 when they were invited to the Gator Bowl and defeated West Virginia. They have gone to a bowl in 36 straight seasons, including a 14-year run of top-5 finishes in the Top 25 from 1987-2000 under coach Bobby Bowden. The streak is so long that it’s older than current Florida State offensive coordinator Walt Bell, who was born in June 1984. The streak has had some close calls, including last season as Florida State had to rally in November to make a run to a bowl game. The Seminoles were 3-6 before they defeated Delaware State, Florida and Louisiana-Monroe to become bowl-eligible. That stretch was easier as Florida State didn’t face a ranked team. This time the Seminoles have finished with six ranked opponents in their final seven games. Bowden said he won’t be disappointed if the bowl streak is broken. And this may be the year. The Seminoles have lost three straight games by a combined 148-51, which is the most points given up by Florida State in a three-game stretch in program history. A defense that was applying pressure to the quarterback as well as stopping the run now has struggled in the last three games. In losses to Clemson, NC State and Notre Dame, Florida State hasn’t recorded a sack and has given up 662 rushing yards. Florida State’s offense found some success in a 48-27 loss at NC State two weeks ago, where James Blackman filled in and threw for 421 yards and four touchdowns. But neither Blackman nor Deondre Francois, who returned from a rib injury in the 42-13 loss at Notre Dame, have been able to rally the Seminoles. Still, players say the streak is priority. And to many, it is the “only thing that’s on our mind right now,” said cornerback Stanford Samuels III. Bowden said fans must be patient with Taggart, who led rebuilding efforts at Western Kentucky and South Florida before spending one season at Oregon. 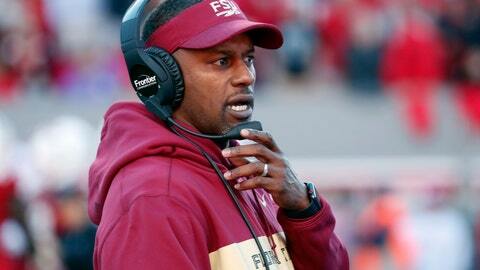 Now in his first year at Florida State, Taggart looks to repair the foundation for the program. The standard that Bowden and his teams set, one of consistently playing in the postseason, now hangs in the balance.